Once a preliminary examination proceeds to investigation, the Office of the Prosecutor has the task of selecting and prioritising potential cases that could surface before the Court. This chapter examines the criteria for case selection and prioritisation followed by a discussion of possible charges that could be prosecuted before the International Criminal Court in the context of the Israeli-Palestinian conflict. The scope of the preliminary examination is limited by various jurisdictional parameters. 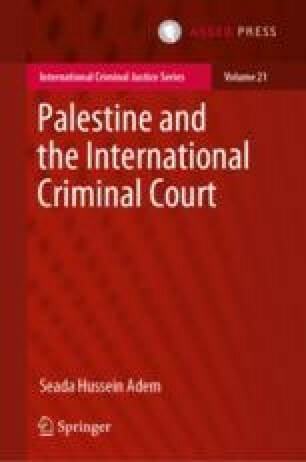 As this study deals with the same issue in light of the Rome Statute, the Elements of Crimes, the criteria for case selection, it does not examine all possible cases that may emanate from the situation in Palestine. It rather discusses alleged crimes that represent ‘the true extent of criminality’ and ‘the scale and impact’ of the alleged crimes in the situation that fall within the jurisdiction of Court. Amongst the core crimes of the Statute, the study examines possible war crimes and crimes against humanity allegedly committed in the Palestine situation, emphasising cases with legal issues unique to the situation. Amnesty International (2015) Israel/OPT: No justification for deliberate attacks on civilians, unlawful killings by Israeli forces, or collective punishment of Palestinians. https://www.amnesty.org/en/documents/mde15/2633/2015/en/. Accessed 17 October 2016. Aranburu X (2010) Prosecuting the most responsible for international crimes: Dilemmas of definition and prosecutorial discretion. https://www.academia.edu/2571646/Prosecuting_the_most_Responsible_for_International_Crimes_Dilemmas_of_Definition_and_Prosecutorial_Discretion Accessed 2 September 2016. Human Rights Watch (2015) World Report 2015: Israel/Palestine events of 2014. https://www.hrw.org/world-report/2015/country-chapters/israel/palestine. Accessed 16 June 2016. Human Rights Watch (2016) Extreme measures: Abuses against children detained as national security threat. https://www.hrw.org/report/2016/07/28/extreme-measures/abuses-against-children-detained-national-security-threats. Accessed 17 October 2016. ICRC (1958) Commentary of 1958: Article 59 of Geneva Convention IV. https://ihl-databases.icrc.org/applic/ihl/ihl.nsf/COM/380-600066?OpenDocument. Accessed 14 August 2016. ICRC (2002b) Implementation of the Fourth Geneva Convention in the occupied Palestinian territories: History of a multilateral process (1997–2001). Article, International Review of the Red Cross, No. 847. https://www.icrc.org/eng/resources/documents/article/other/5fldpj.htm. Accessed 20 November 2016. The Leadership Conference (2011) Restoring a national consensus: The need to end racial profiling in America. http://cdm266901.cdmhost.com/cdm/ref/collection/p266901coll4/id/3486. Accessed 30 May 2017. OTP (2015) Strategic plan: 2016–2018. https://www.icc-cpi.int/iccdocs/otp/EN-OTP_Strategic_Plan_2016-2018.pdf. Accessed 16 November 2016. OTP (2016) Policy paper on case selection and prioritisation. https://www.icc-cpi.int/itemsDocuments/20160915_OTP-Policy_Case-Selection_Eng.pdf. Accessed 16 December 2016.